Twistfix is pleased to announce that its best-selling replacement Cavity Wall Ties have been tested by the European Technical Approval body in Denmark and have been approved to carry the CE mark. Helical ties have long been established as the most rapid, versatile and effective replacement cavity wall tie system available. The patented Airtwist Cavity Tie System utilises the innovative unique CD Tie Driver to make cavity tie replacement simple and to reduce tooling costs by 75% compared to less advance cavity wall tie products. 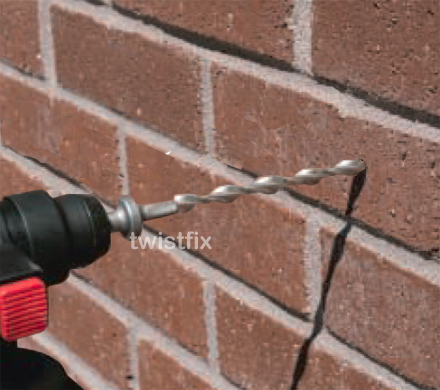 Twistfix replacement cavity wall ties cork- screw in to brick or concrete when driven into undersize pilot holes using the impact action of a rotary hammer drill. The helical ties grip the masonry on both sides of the cavity wall to provide an inert interlock connection that imparts no point loads or expansive stress. Patented Cavity Wall Ties with European CE mark Approval.